Doehling Law, P.C. represents accident victims who have been injured due to the negligence of an individual or company. We provide each client the care and attention his or her case needs and deserves to ensure a quality outcome. During this process, we carefully evaluate your claim and explain your options allowing you to make important decisions related to your case. We understand the immense impact an accident has on your life, and our goal is to take care of the legal aspects of your case so you can focus on getting healthy and making a speedy recovery. Our office is equipped to take on insurance companies, fighting to recover maximum compensation for your suffering. Attorney Gary Doehling offers insight into the tactics of insurance companies based on more than 25 years of experience in insurance defense. He now uses that experience to provide meaningful representation to those who have been wrongfully injured. 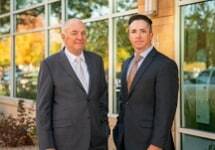 Keller Caubarreaux joined Doehling Law in early 2012 assisting Gary in his quest to provide the best possible legal representation for accident victims throughout Colorado and Utah. Whether you have been injured in a car accident, ski accident, or otherwise injured because of someone else's negligence, Doehling Law knows what to do and we are here to help. Call today for a free consultation so we can educate you about your rights and assist you with your claim.